Teaching English as an ESL teacher can be a rewarding experience in many ways. For some teachers, it is all about being able to travel and see the world. For some, it is about getting some valuable experience in their field before searching for a job at home. Others still, find it rewarding just to be in a classroom full of eager students looking to learn, whether they be kindergarteners, primary school- or high school students, or even college students. There are countless ways of feeling the rewards of teaching English to speakers of other languages, and I don’t presume to know them all, only my own personal reason. Many of my current colleagues would never believe me if I told them, that I’d never thought I would be teaching in China, let alone for almost 8 years now. Even 10 years ago, if you had told me that I would be teaching and living in China, I would likely have looked at you with wonder, and thought to myself, how you’d have that idea? But here I am, 8 years in and I am probably staying for at least a few more years. Many might not know this, but there is definitely a career to be made in ESL teaching, not just in China but in several places and your career can be built in many different ways. When I started teaching in China, a career in ESL wasn’t my long-term goal. I initially saw ESL teaching as a stepping stone to getting into China and try to either find a job in marketing, study for a Master’s Degree or become some kind of consultant. I didn’t really have it all mapped out, but when I finally did arrive in China and started teaching, I realized that I liked it. It was hard at first, and for a few months, I felt uncomfortable in the classroom. However, as time went by and I started to understand how to put together a lesson, make the students laugh and actually teach them something, I began to feel a great sense of achievement, much more so than anything I had ever felt before. And I decided that a career in Education was going to be my choice! Through the years, I have found that there are several ways turn your ESL teaching job into a long-lasting career. Either by staying with your school or by transitioning to other schools or other cities. If you value your free time, and you prefer traveling and seeing new places, it might make sense for you to work for one or two years in a school in one city. You can gain valuable experience and references, and when you want to explore a new place, you can apply for jobs in a different town or country. This is ideal if you re desire traveling and seeing the world while doing something familiar. While locations vary and procedures change from school to school, what you are doing in the classroom is mostly the same. If you are looking for career progression, it may we smart to stay with a single school for a longer time and work toward one of the higher-level positions they may have. Some schools may have a position as a foreign teacher supervisor or Director of Studies, other schools may have positions along of academic trainer, marketing or even course curriculum development or teaching research. I find that not every school advertises positions like these but if you ask, most, if not all schools, would be interested in having their foreign teachers assume a greater responsibility at their school, working to improve their overall quality. Over my time working in China, I started as a Foreign Teacher myself, I have since then been involved in arranging marketing activities and events. I do language and pronunciation training with the Chinese teachers, I plan activities and events for our current students, I train and oversee the foreign teachers in my department. Also, my school is using my voice for some of our in-house teaching materials. Academic Training, Marketing, Recruitment, Management, Content Creation, Curriculum Development or Teaching Research, the options are endless if you want to advance your career. And many times, all you have to do, is show your supervisors what you can do for them. I never saw ESL teaching as just a “teaching job that I got because I couldn’t get anything else.” For me, it became a calling, a passion and the chance to give something to others. But I have also been able to advance myself, advance my career and find ways to make my school better for myself, the students, my colleagues foreign and Chinese. The possibilities are endless, you just have to go for it! While I found it hard to accept at the beginning of teaching in China, it is widespread that teachers here use a single WeChat account for their work as well as personal life. It is not uncommon to see people using China’s most popular messaging app and have both their bosses, colleagues, friends, and family all together. It makes everyone easily reachable but can also blur the line between work life and personal life. But most of my colleagues have found a healthy balance, and in time, I did too. So much so, that I am now entirely comfortable having my family, friends, co-workers, my supervisors and students on WeChat. But that’s another story, what I want to write about, is how I, for a time, used WeChat to practice vocabulary and pronunciation with some of my one-on-one students. Pronunciation is an important aspect of English learning, and sometimes, it is difficult for Chinese students to master the sounds of the English words. Foreign teachers are often asked to focus more on speaking and pronunciation, but we do not always see students as often as we’d like to practice with them, which is where WeChat comes in. I have had the pleasure of tutoring a few adult students, and WeChat became an essential tool for us, in between classes. We could practice for 5 minutes during lunch breaks, or after dinner when we were relaxing and catch up and review the content of the last lesson, and I could check their pronunciation of the vocabulary and their sentence use. We did not always use books to teach from, so I could also use my own voice to record a model of pronunciation for words and sentences directly on my phone and send it to them to listen to. While the voice messaging works well for a single student, it becomes tedious if you have to record yourself multiple times. You can add multiple users in a group, but that made giving individual feedback time consuming, and if not all the students are at the same level of the same book, that only amplifies things. Thankfully, WeChat has a “favorites” function that lets you save files on your device for later use. Using the voice recorder on my phone, you can record a part of your lesson, name it, add it to your favorites and send it to the students who need it. If you add all your files neatly into folders, you don’t even need the favorites function. Your student can then download your voice file and listen to it again, and again, straight from their phone. It is really quite simple. First, you need to locate your voice recorder. Depending on your brand of phone, it may be on your main screen or in a folder named something along the lines of “tools” or “(brand name) apps.” I have a Samsung smart phone, and my voice recorder is found in a Samsung folder on my main screen. Using the voice recorder, I can record my voice for the words, sentences or dialogue, name it and save it on my phone. Then either directly from my voice recording app or through the file explorer on my phone, I can find the sound file I want to send, long press it and I click the “share button.” Then, add it to the WeChat favorites for later, or send it directly to the student who needs it. The difference between sending a file and just sending a voice message is that the file can be downloaded and saved, and also has an identifiable name. Voice messages in WeChat do not carry any information, and you have to listen to the message itself to know what it is. Also, voice messages cannot be downloaded or forwarded, and they are not searchable. Using WeChat in this way, student can keep learning when they are on the move, or on the subway and likely looking at their phone anyway. It is also great for conversation practice as it can happen any time in any place, as long as you’re connected. Now that we have looked at the different stages of culture shock that you go through in a new country, it is time to look at how some people experience a sort of Reverse Culture shock when they come back to home after years abroad. For me, coming from a small country like Denmark with considerably fewer people than China, it was the open spaces and emptiness that made me feel awkward being back in my once familiar surroundings. Above, I have a photo I took in Shanghai on the pedestrian street known as Nanjing Lu. 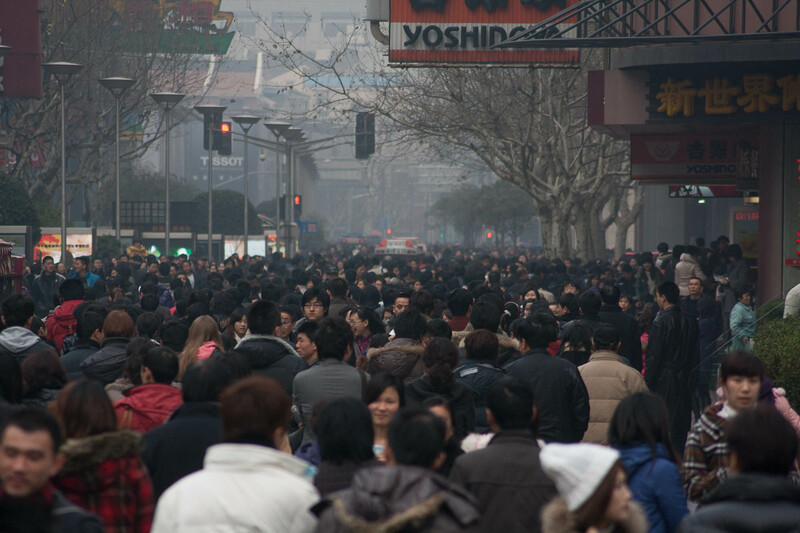 It is the main shopping street in Shanghai, and there are thousands of people walking here. I took this photo back in 2010 on my first trip to Shanghai, but the sight is the same today if you are there around the time of the Spring Festival like I was. The street is absolutely packed with people. For contrast, try and look at the photo below, taken in Ringsted in Denmark, close to where I grew up. 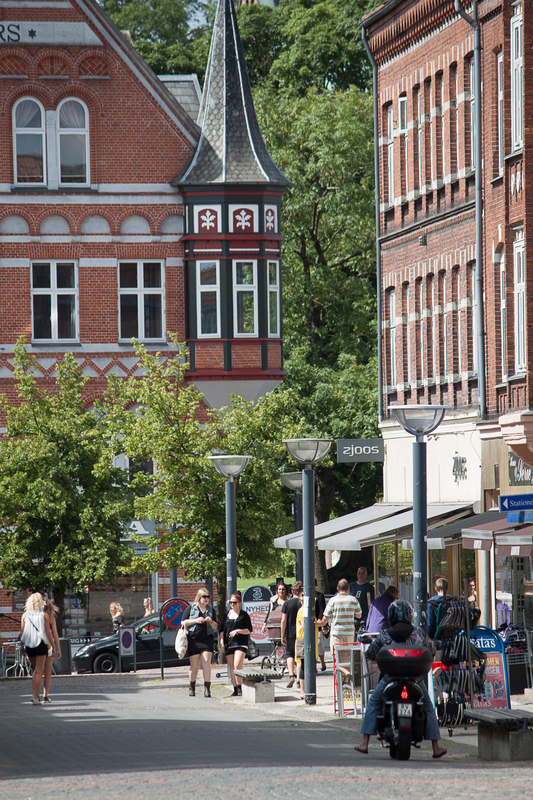 And then consider the next photo from the main shopping street in Copenhagen, the biggest city in Denmark. Now, to be honest, the picture in Shanghai is taken around the most important Chinese festival of the year in China, the photo from Ringsted is taken during a weekday in the summer break and so is the one from Copenhagen. You cannot really compare the images, but still, the difference is striking. Whenever I come back to Denmark, I am amazed at how much space I have, how few people I see and, how expensive everything suddenly is. I don’t have to worry so much about getting on the bus, there are plenty of seats, but unlike China, in many parts of Denmark, the bus only leaves once every hour. And where in China, taking the bus costs about 2 yuan, in Denmark a single bus fare is closer to 20 yuan, and don’t even get me started on the trains. In China, everything is convenient. I live close to everything, I can have just about anything in the world delivered to me, and I haven’t actually considered getting a car, there is just no need. In Denmark, we spend a lot of time driving around to get to places, because not everything is within walking distance. Speaking Danish again after two years abroad and only speaking it a few times a month is also an adjustment. I suddenly understand everything around me, even people who just walk past me on the street. I feel connected to other people even though I do not know them. Reverse culture shock is real. It doesn’t happen to anyone in the same way, but many feel a sense of awkwardness when they return to their own country after spending a few years abroad, getting used to how their life is there. It isn’t usually as severe as culture shock you experience living abroad. When I go home on holiday, I a typically at home for about three or four weeks. It takes me, sometimes a week, to get adjusted to living in Denmark again, and then, when I travel back to China I need a few days to get back to normal life there again. When the depression finally hit me in China, I made a conscious choice that I wasn’t going to let it ruin my time here. I decided not to give in to the homesickness, focus on my work and try to learn about the things I didn’t understand, instead of just complaining about them. I also knew that my time in Changsha was going to be limited. Once I would finish my internship, I would likely move somewhere else, and I’d have a chance to start over fresh. This method isn’t necessarily the magic cure, just bite down and focus on work, but for me, it helped. Focusing myself on working and learning as much as I could about my surroundings, meant that I kept myself busy (too busy to think about other things), and I also accumulated a lot of knowledge about the local culture, customs and their way of life. For some, they’ll need to focus more on physical activities, or do sports or go to the gym like they’d do in their home country to feel more at home. We are all different, and we will need different ways of dealing with the depression phase, if and when it sets in. Doing observation classes with teachers and the school principal at my school in Changsha. After a while, things started to get better. Once you start to accept your new surroundings and how different everything is, you can focus on learning more about it, understanding it and take it in to make it part of your new life. You won’t be able to live in the same way as you did back home. Luckily for me, I didn’t want to. I moved to China to explore something different, to live differently and more independently than I had ever done before. But when I first arrived, I still had blinders on, expecting the Chinese people to behave like Danish people. It doesn’t work like that, and you have to embrace it, learn from it and make it part of your new life. It isn’t quite as easy as it sounds, and it takes a bit of work finding a suitable compromise between being who you are and changing just enough to fit into your new surroundings. You learn to appreciate the 2-hour lunch break, the energy of the people around you, the funny little things you see every day that you’d never see back home. You also learn to be flexible. Danish people tend to love schedules and to have plans for weeks ahead. In China, things are sometimes more fluid, and you have to adjust your plans a lot. That used to bother me a lot at first, but now, it is just a way of life. I have learned to embrace and love the life I live now. I still miss Denmark, and how quiet and calm everything is. As I am writing this, I am back in Denmark on holiday for three weeks, and I love everything about being back home. Being home makes me realize how much I am missing all the things I took for granted when I lived here more than seven years ago now. Which brings me to my next article, about Reverse Culture shock, which is what you experience when you have been away from home for a while and come back to what your life used to be, which is typically quite different from your life in China. It can sometimes feel like Culture Shock all over again, but in your own country and in your own home.